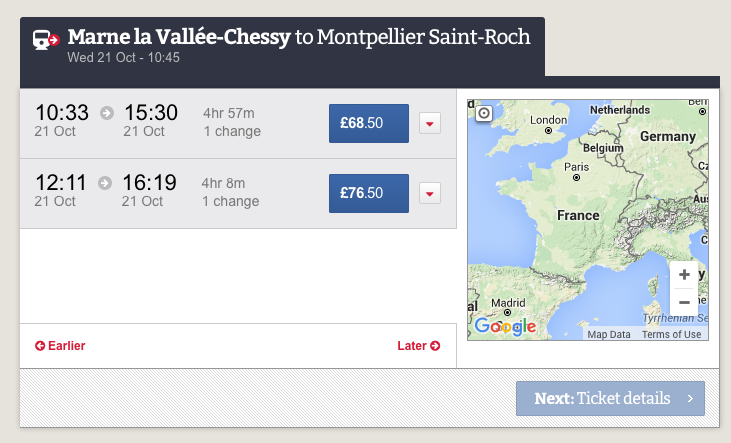 A couple of weeks ago Seat61 had the splash that booking cross-border France-Spain TGVs would cost you more on French language websites than anywhere else (Seat61’s news page here – you have to scroll down as he has no link to individual stories). 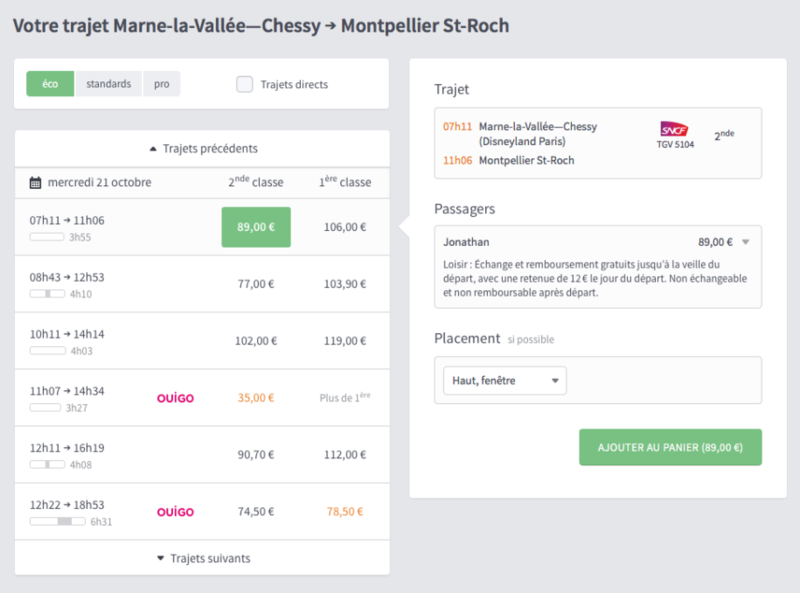 After a bit of a furore that caused, SNCF has changed its practice and now the prices for these trains are the same regardless of where you book them. It was an error they told Gizmodo – not sure I believe that, but anyway, that problem is no more. 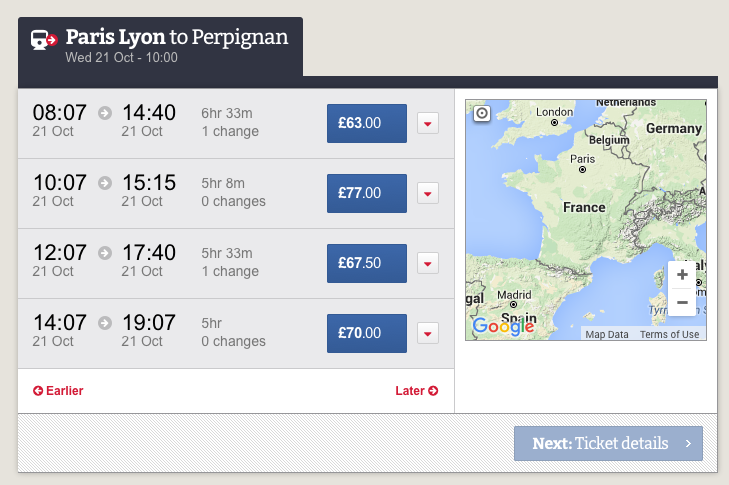 So while that’s progress, it’s not all plain sailing in French rail booking. 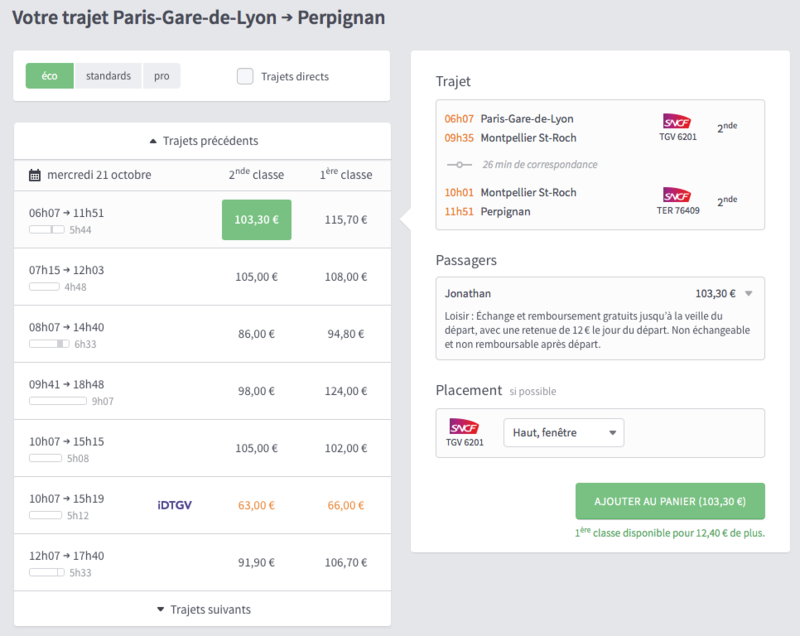 SNCF offers essentially three classes of TGVs – regular ones, iDTGV that’s like a regular TGV but you have to book online, and Ouigo, like a kind of Ryanair-TGV that has it’s own garish paint scheme and interior and leaves from a station in the Paris suburbs. I’d love to know what’s going on here. Is it that these external agents have not asked for access to the iDTGV and Ouigo data? That SNCF will not give this data to companies outside France? Or maybe SNCB considers itself a premium service, but I’m pretty sure that Loco2 would aim to sell the cheapest tickets it can as its primary pitch is to tourists. Also another trick I’ve just encountered is courtesy of SNCB Europe. 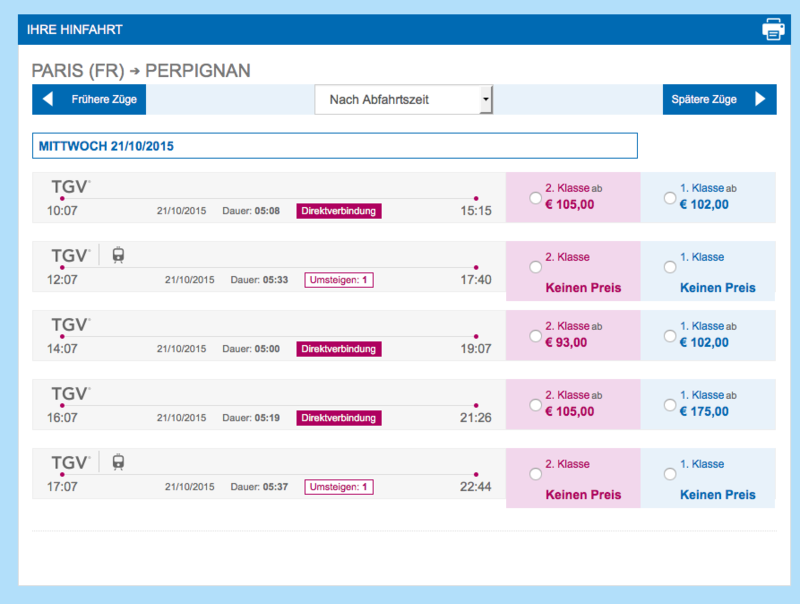 Seat reservations on German trains run by DB normally cost €4,50. 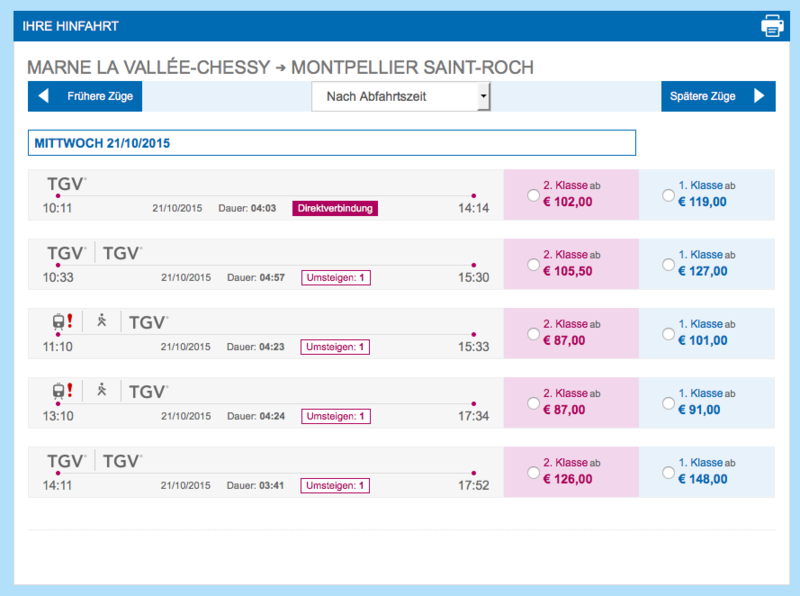 Book a DB train via SNCB’s website and it’s €5. Thanks, SNCB! The cause for the difference in the reservation fees is that the selling operator sets these fees themselves (as long as it’s a normal reservation without supplement, such as for an ICE). DB charges 4.50 per passenger per one way journey (which may include more than one train), NMBS/SNCB 5.00 per passenger per train and NS 4.00 per passenger per train. The reason that Loco2 and the other sites don’t offer IDTGV or OuiGo is because although both of these companies are subsidiaries of SNCF, they operate independently (probably because SNCF are trying to introduce “competitive” operators into the market as a test run for when real competition hits), and the trains do not appear in the core SNCF ticketing engine (“Resarail”). This means that we need to have a separate contract and technical integration with both companies in order to offer tickets and we’ve not yet prioritised this (focusing instead on wider pan-European coverage, such as integrating with Trenitalia, which we launched earlier this year). We hope to secure contracts with both companies and begin integrations in the near future, now that we have Trenitalia fully launched and our technical capacity is freed up to begin additional integrations. Note that our current lack of these trains is disclosed on our site at https://loco2.com/about/train-ticket-coverage. Let me know if you have any further comments or questions!